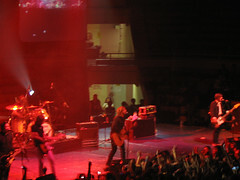 No Special Effects: Switchfoot In Manila!!!!!!! I'll try to make this short, but it does have 3 parts. So I'll write about them separately. Read each part at your pleasure. 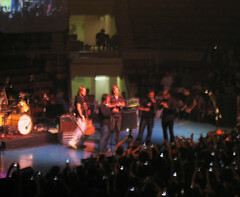 Jon Foreman singing Only Hope solo before being joined by the band for a grungier version. 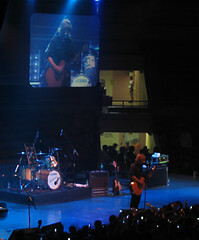 I sat at the Lower Box reasonably near the stage, so only my pictures suffered, not my experience. I didn't have a companion with me but the energy was so high that it scarcely mattered. Also, it made me realize that there's always going to be a bigger fan, of course. I was surprised to find people singing along to "Chem 6A," one of their first songs that never made it here on an album. They didn't sing some of my more favorite songs, such as "24" and "New Way To Be Human" but it was a respectable selection of songs, not to mention they had to promote their new album, that despite being out for months in other countries, was just released here 2 weeks ago. Boo, Columbia. 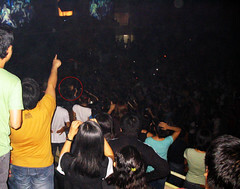 The audience (especially those at the mosh pit and close areas) was made up of die-hard Christian Rock fans. I'm glad I didn't get a more expensive ticket, as I am way too old and too small to be jumping up and down while being crushed. Of course, there's a few cringeworthy moments. 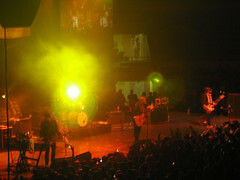 Sometime near the end, at least 2 fans went up on stage and pranced around like a bunch of lunatics. Not only could they have disrupted the band's concentration/instruments and ruined the show, but that was a clear attempt at making a great celebration of great music somehow about YOU. Way to go, douchebags. Thanks heavens the band played through it while stagehands dragged them off. 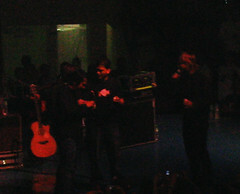 Intermission consisted of Jerome Fontamillas (a Filipino bandmate and his first visit here since being born here) trying to get the rest of the band to eat balut (embryonated duck egg). It was funny, but I'm not comfortable revelling in other people's discomfort. Well, at least not people I admire, ha ha. Plus, that thing people do to foreigners, where you dare others into doing the local crap? Cringe-y! I am obviously a killjoy and not a lot of fun, but I don't care. There were plenty of great moments, but the spotlight was definitely on the inspirational music, which is what drew me to the band in the first place. Jon Foreman singing from the audience.